Part one of this post describes what an assessment is and why it’s important. This post describes how you can make them fun using the new Visual Assessment tool. How can you make a quiz/assessment fun? In the eLearning world, there are a number of ways to make assessments fun. For one, you can create an entire learning module around a game, where the questions—and “Is this your final answer?” -- could be the assessment. Visual Assessment, an easy-to-use new tool, helps you create fun assessments. Visual Assessment is the latest Evolve Interaction for the Raptivity Interaction Builder. Like we discussed earlier, the assessment can be used during the eLearning class/module, similar to a pop quiz after each page say, or as a test at the end of the eLearning class/module. 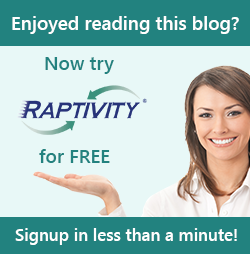 Raptivity users will find the latest Evolve Interaction easy to use. It also has a couple features which separates it from other assessment tools. An optional introduction page can be added to your assessment. This introduction page can be used to describe how to complete the assessment or can contain additional eLearning information. ELearners can go back and forth to this page, which makes it easy to do an Open Book eLearning style class. You could also use the introduction page to present a new company regulation, such as one for safety. On the introduction page, you could state the regulation; describe when it’s used, and consequences for not using it. Use the next page to ask questions to reinforce that the employee understands this new regulation. Employees could go back and forth to the introduction page until they are able to pass the assessment. Interesting ways to question eLearners include a number of new options. First, you can allow eLearners to change questions, come back to any question and retake it, until submission. Second, you can combine media-based questions with text-based questions. An example of this might be a description of a particular heart valve condition. You could then ask the eLearner to map the description to the related picture of the particular heart valve condition. Third, you can set a time to complete the assessment. This being a visual assessment, it uses audio, graphics or video clippets as part of the assessment. While I may be able to describe various ways to make your assessment visual, the best way I know is to show you. Click here to see the Visual Assessment tool in action. I hope this gives you a good understanding of eLearning assessments and our new tool for creating them. If you have any questions about assessments or the Visual Assessment tool, email me at janhavi@harbingergroup.com. I’d love to hear from you. After writing this post, I finished our conversation on Friday quizzes this way. Janhavi: Let’s see … You are taking the quizzes in Spelling, Vocabulary, and Math simply to show yourself (because you do get to exchange papers and grade them right away) and your teacher how much you’ve learned this week. Janhavi: And, that’s a good thing! You also get to bring them home and show your parents how well you’re doing. Janhavi: And, perhaps, we should start celebrating how well you do on your quizzes every Friday. 4th grade Son: Yeah! Quizzes aren’t that bad. Janhavi: [Laughing] how did you do on those quizzes anyway?